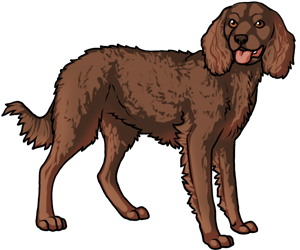 Although the exact origins of the American Water Spaniel are unknown, it is believed to have been developed in the United States around the great lakes area. It's ancestors include the Irish Water Spaniel and the Curly-Coated Retriever. The breed was developed with the purpose of retrieving game from boats and hunting. Today, it is still an excellent hunter and one of the primary choices of game hunters in America. The AWS is considered a rare breed with only 270 individual dogs registered with the AKC in the 1900s. The AWS is the state dog of Wisconsin. The most major health issue to American Water Spaniels is Mitral Valve disease.